An imp named Ryszard Poppart can spin straw into gold, but can he outsmart the evil king who wishes to marry the miller’s daughter? Ryszard loves Saxonia and desires to save the kingdom from the evil king. The miller’s daughter, Galiana Mueller, agrees to help expose the king’s terrible, selfish ways. As Ryszard spins gold for her to tempt the king with, he cannot help falling in love with her himself. The king soon demands Galiana’s hand, wishing for more straw-spun-gold, more wealth, and more power. As he becomes corrupt entirely, Ryszard must utilize a power stronger than his magic, that of love or perhaps hope. 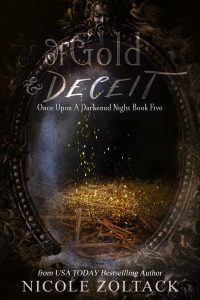 Of Gold and Deceit also includes the short stories The Cost of Dominance and The Cost of Intolerance.